Septicflesh, for those somehow not in the know, fall between Rotting Christ and Moonspell in the Gothic pantheon, having neither the former’s sense of tradition and warfare nor the latter’s vampiric charm. No, these guys are much too grand for that, preferring to take on a gloriously epic tone as they preach chilling yet riff-filled sermons, ably backed by the Prague Philharmonic Orchestra and enhanced with the glorious soprano of Androniki Skoula. Fear not, ye whiners; by far the majority of the vocals are handled by bassist Seth, his angry snarl working well with the music throughout, yet Androniki’s voice is wonderful wherever it is administered. It’s hard not to go a little overboard with praise for the band, really, as they’ve clearly done a terrific job. This is definitely a step forward from Communion, adding complexity to the songwriting without losing that compelling catchiness – it’s quite a remarkable achievement, really. Opener and first single The Vampire From Nazareth builds up orchestrally before exploding into a growl-and-guitar-fuelled stomp, hitting crescendo after crescendo before slowly crawling back and ending in a melancholic chant. That it’s brilliant yet far from the best the album has to offer is one of many pleasant surprises about The Great Mass. The bouncy opening of Pyramid God with the subsequent twists and turns between growled heaviness and ominous orchestral march are just one of many reasons why Septicflesh have more than surpassed Therion as the symphonic band of the moment. Elsewhere, Dimmu Borgir’s throne is more than stolen by the likes of Five-Pointed Star, speedy blackened torrents of epic rancour, with a break for the orchestra to show off before restarting the metal – proving beyond all doubt that black metal can be distilled with orchestration and death metal riffing to produce something quite fantastic. Yet it’s unfair to Septicflesh to relegate them to the mere status of “like another band, but better”. Few bands have such ugly names, but make such beautiful music. The mesmerising Oceans Of Grey whips along, switching between hate-filled metal violence and peaceful operatic trills, giving way for the melancholic bursts of sorrow in The Dead Keep Dreaming. Even the shorter tracks that would be filler on other albums here have worth of their own, the catchy Rising one good example, the riff-driven Mad Architect another. By the time you’ve reached singalong closer Therianthropy and the great mass is over, the sense of having participated in some grand ritual, something rare and special, is palpable. 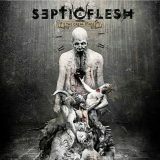 Septicflesh have more than surpassed themselves here, building on the lessons of Communion and ensuring that their name is at the forefront when symphonic metal is mentioned.